An obsession with linear time and space. Showers forth a parade of Chthonos and Telluria. Enjoying the company of the Lord of Dung and Flies. Unsurpassed amidst the Infernal Horde. And some named him "the High God" and "Our Father". "How delightful! A means to thin the herd!" Disrupted by the infiltrations of vacillating celestials. And the colorful stellae arranged on its brink. Given authority on account of his previous remove. Where he used his magic to charm and dominate. "This I must see!" exclaimed Mastema. And the Sky Council (sod) were traversed. Arrived during an auspicious moment. Didst have in mind a Grand Hierarchy. Have I anointed him, whom ye now behold. Shall bow, and shall confess him Lord." Or indeed surpassed, the one called "Most High". "What manner of godliness this? Without knowing and testing the authority thereof? And choose to bend the supple knee?" Cleaving High and Low, and that Between. With a demonstration of temperance. Apparently mistaking Belial for his lackey. "Know you not your true heritage? Shall teach us of the best deeds. By proof try who is our equal!" Who were intent upon a complete victory. Those who subsequently sought refuge. In favor of the Subterranean rebels. Or winning through in transformative ordeal. With a method heretofore untried and dangerous. Raped her, seeding himself inside her womb. Mary was disposed to the care of the god. Made possible by the son's accomplices. To news of all this, Mephisto expressed delight. "Let us play along, this travesty undoes the tyrant!" The common tale (much exaggerated!) unfolded. Of the dying god as salvation. And content to have won his way into the Underworld. And setting the stage for the maturation of Anthropos. And the petty tyrant departed for other worlds. 1997, 2001-2008 to 2666; all rights reserved. 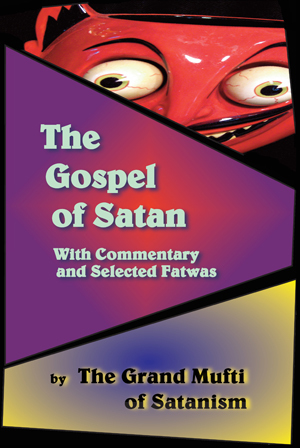 In contradistinction to the Gospel of Christ, the gospel of Satan teaches salvation by works. It inculcates justification before God on the ground of human merits. Its sacramental phrase is "Be good and do good".... It announces salvation by character, which reverses the order of God's Word, character by, as the fruit of, salvation. Its various ramifications and organizations are manifold. Temperance, Reform movements, "Christian Socialist Leagues", ethical culture societies, "Peace Congresses" are all employed (perhaps unconsciously) in proclaiming this gospel of Satan -- salvation by works. The pledge-card is substituted for Christ; social purity for individual regeneration, and politics and philosophy for doctrine and godliness. The cultivation of the old man is considered "more practical" than the creation of a new man in Christ Jesus; whilst universal peace is looked for apart from the interposition and return of the Prince of Peace. The apostles of Satan ... minimize [sin] by declaring that sin is merely ignorance or the absence of good.... ...they make God a liar by declaring that He is too loving and merciful to send any of His own creatures to eternal torment. 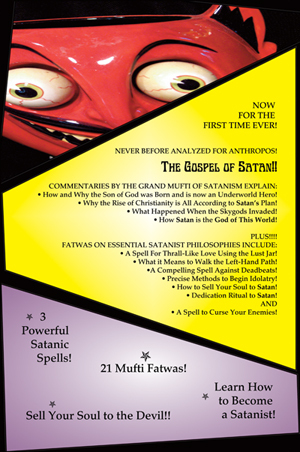 The Gospel of Satan is now a book, with commentary, by the author! Free Spells from eclectic witches, Coven Kyklos, in their Book of Shadows, called "Spiritual Spells"